2008 Wisconsin Badgers season preview from Maddux Sports. Below you can find our official Wisconsin Badgers football preview as well as the 2008 Wisconsin Badgers Football Schedule. 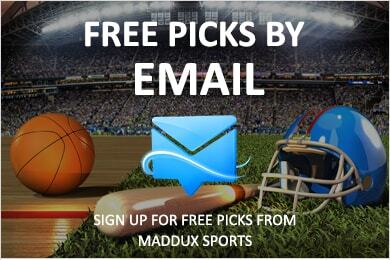 Dont miss Maddux's free college football picks on the weekly college football odds from the #1 sports handicapping team. Last season, the Wisconsin Badgers (9-4 overall, 5-3 Big Ten) finished tied for fourth in the conference, having lost to Illinois, Penn State and OSU. The club met the Tennessee in the Outback Bowl, losing to the Volunteers 21-17. The Badgers will be running more than passing. The Wisconsin offensive line returns all of its starters. It’s a tough, seasoned and athletic group. The running back spot features junior P.J. Hill (233 CAR, 1,212 YDS, 14 TDs), who in two seasons has racked up 29 touchdowns and 2,805 yards. The backs are deep and speedy on this team and include Zach Brown, Lance Smith and John Clay. Last season the team averaged 200.8 ground yards per game, making them 21st nationally and second in the conference. Whoever is at QB—either senior Allan Evridge or junior Dustin Sherer—will be starting their first college game ever. The wide receiver spot is lacking but senior Travis Beckum (75 REC, 982 YDS, 6 TDs) at TE is one of the best in the nation. In 2007, the defensive unit struggled, allowing 222.5 yards in the air and 134.1 yards on the ground. This spring 12 defensive players could not participate in camp due to injury, including five starters. Two corners, two tackles and an end were out. It’s unsure if many of those injured on the defensive unit will be ready to start when the season opens. If the “D” can get healthy, Wisconsin should field a better-than-average line, middle and secondary. Will these Badgers go undefeated? Key games include when the club visits Michigan on September 27 and home contests versus Ohio State on October 4 and Illinois on October 25. Any of those can go either way with the back-to-back Wolverine-Buckeye contests being especially taxing. Coach Bret Bielema (21-5 in two years and overall) is starting just his third season ever as a head coach and his third as the Badgers’ main man. There’s a fine veteran squad returning but health is certainly a concern. Wisconsin has a very tough schedule and they’ll need every man healthy if they expect to contend for the top spot in the Big Ten. For more info on the 2008 Wisconsin Badgers football program, view their official website or read up on the rest of the Big Ten foes below. All of the Big Ten Conference teams are listed to the right. Each team link gives our individual preview for the selected Big 10 club. For non Big Ten teams visit our college football preview page. The Big Ten Football Preview page gives you are order of finish and a quick overview. Is Rich Rodriguez the man to lead the Wolverines back to a national title? Can anyone catch Ohio State? Is Iowa ready to return to the top of the Big 10? Our home page features Sports Betting Picks!